Once through the doors, first-time visitors are warmly welcomed by HOPE’s Lobby Team. Team members not only bring their God-given talent for friendliness to the job, they rely on their training to help optimize that first-impression opportunity. Whether it’s helping folks find the restrooms, the nursery, or a cup of coffee, the team is accessible, open and well-equipped to answer any and all questions. The key to this level of hospitality is making sure each member of the lobby team understands her/his role in the overall mission and vision of the church. About five years ago, HOPE made a paradigm shift, casting a vision of being a church of small groups rather than a church with small groups. Today, the church has close to 60 small-group offerings. There is literally something for everyone at HOPE UMC, where individuals can connect with others, form communities and grow together in their faith walk. “This past year, we launched a successful, online small-group opportunity for those whose schedules might not permit attending a Bible study in person or for those who are not part of the HOPE family,” Bills said. Additionally, HOPE’s youth ministry sees anywhere from 65 to 80 middle-school and high-school youth attending worship and small groups each Sunday evening. More than 90 children make up the weekly Kidz Konnect Sunday morning worship and small-group gatherings. Following Jesus’ model, the community of HOPE serves others through the operation of a food pantry, support of annual adult missions teams traveling to Haiti and Cuba, and partnering with several Camden City initiatives, including Urban Mission Fellowship, which was founded by a member of HOPE Church. 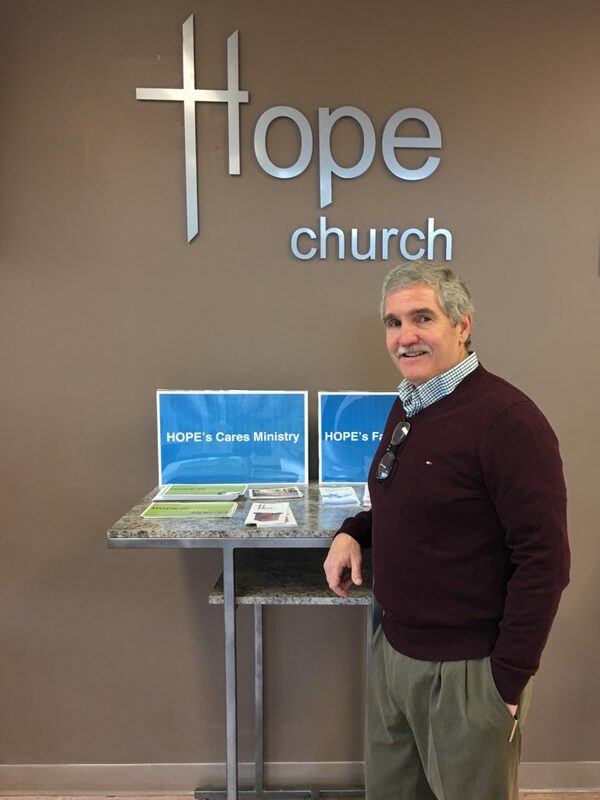 Not being afraid of change or failure, HOPE has grown steadily into one of the largest churches in GNJ, with more than 1,500 individuals calling it their faith home. “HOPE in 2017 looks very different from how it looked in 2000, and how it looked in 2000 is very different from 1990. All along, I have taught and modeled that growth requires change, change often creates conflict, and conflict handled in God-honoring ways, makes things better,” Bills said. Apostle: Rev Jeff Bills serves as lead pastor of HOPE UMC and lives in Voorhees along with his wife, Marilyn and two sons, Joshua and Matthew. He served as an associate pastor at Haddonfield UMC for six years overseeing education ministries before launching HOPE Church in 1990. Bills has served as Chairman of the Board for Urban Promise in Camden and for Urban Promise International. He was Vice-President of the Board for the Ocean Grove Camp Meeting Association and is presently a member of the Key Communications Committee for the Voorhees Township school system. For several years, Bills resisted God’s call on his life to full-time ministry. When he finally said “yes” everything changed quickly. Doors were opened that were previously shut, he met his wife Marilyn the following week and within a few months was accepted into seminary. “Looking back I can see God’s fingerprints everywhere,” he said.